We strongly suggest serious bidders attend our live events in person. In addition to participating directly on auction day, you'll also be able to inspect any property you will bid on. Most events take place in our Chicago auction gallery, on the city's north side. 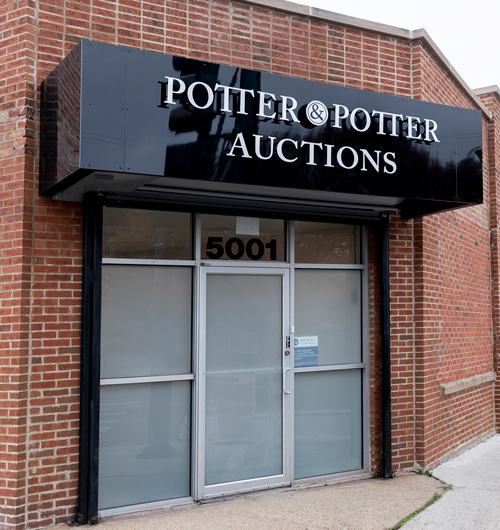 Potter & Potters Auctions is happy to offer various ways for our customers to bid during our auctions. Customers who are unable to attend our auctions in person my place their bids online. Online bidding is an easy and convenient way for customers to bid remotely. There are NO ADDITIONAL charges or fees, and registration is FREE. Sign up today so you can be ready at a moment’s notice to join the action – you never know when you’ll spot the auction item that you can’t live without. Additionally bidding through Potter & Potter Auctions gives you a competitive edge over any other Internet-based bidding platform, because bids placed using our platform take precedence. Can't make it to Chicago and bid live, in person? Arrange to bid live by telephone. Fill out and submit the absentee bidder form and a staff member will call you during the auction. Contact us for additional details. Submit bids in advance of an auction by submitting an absentee bidder form. Your bids are confidential, and your high bid will not be executed unless required by competitive bidding. Absentee bidders frequently purchase items for amounts well below their high bids.